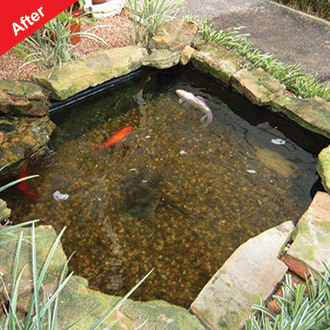 Viresco Aqua - trusted by pond owners for over 19 years! A clear, healthy pond in a few weeks! The award winning pond clear ... There are many pond cleaning products that claim to rid your pond of blanketweed and algae bloom - but as tests show, none work as effectively and economically as ours. Viresco Aqua uses a combination of different micro-organisms that clean water by efficiently removing the soluble nutrients on which algae feeds and digesting the organic matter that makes your pond cloudy. This in turn helps to improve the health of fish by increasing their food uptake and reducing disease. Viresco was originally formulated for use on fish farms and is 100% organic and completely harmless to fish, frogs, newts, pets, plants, insects and humans. It's so safe and pure it can even be used in freshwater aquaria to keep the glass clean! It's totally biological ... easy to use and economical ... one application may last many months ... a good keeper with a long shelf life. Viresco™ Aqua is available in 2.5g, 5g, 10g and 25g packs, please see individual ordering details for all sizes below. FREE! Nitrate Test Strips - worth £3.95! Includes 3 nitrate test strips for use before, during and after testing of your water. Frequently Asked Questions How much do I need? Viresco Aqua gives three benefits to the pond keeper. It removes nitrate and reduces phosphate that feed algae in pond water. As a result, blanketweed (string algae) and algae bloom (green water) die of starvation. Secondly, it digests waste organic matter in the pond. Thirdly, Viresco Aqua will improve the health, growth and disease resistance of fish. Many people see blanketweed dying back within 7 to 10 days. For most people it occurs within about 4 weeks but for some it takes longer. If, after this time, no noticeable change in the nitrate level has taken place, then apply a second dose. Will it affect my fish or other wildlife in my pond? Viresco Aqua is safe for fish. It was initially formulated for use on commercial fish farms to improve the growth, health and disease resistance of the fish. 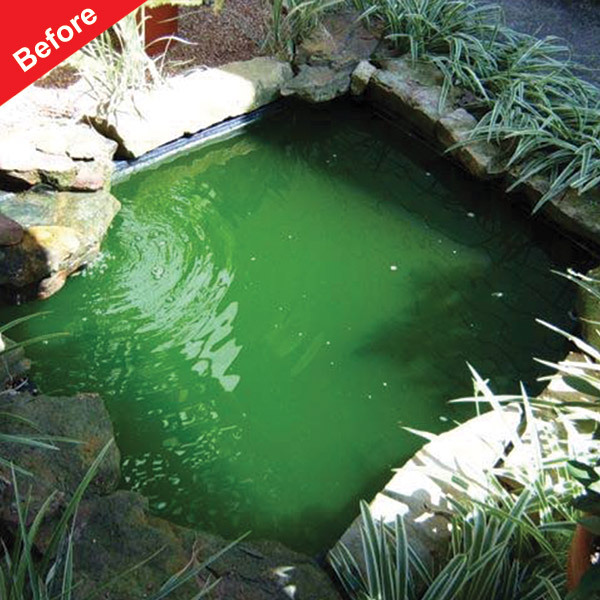 The fact that it suppressed algae growth by removing the nutrients on which algae feed turned out to be a bonus. Fish eat better and grow quicker. They are less prone to fungal and bacterial diseases. Many of our customers have referred to their fish becoming "more lively". The only proviso is that there is plenty oxygen present in the water. There is also no problem for other wildlife, eg newts and frogs. Additionally, Viresco does no harm to plants. However, because Viresco reduces nitrate levels in the water, plants may grow less strongly. For example, leaves of, say, water lilies grow less vigorously but the bonus is that they should flower better. What about other chemicals & additives? Any chemical that knocks back the microbes in a filter system will also knock back the microbes in our Viresco products. Wait for around 10 days until these chemicals have dissipated. Be careful if you have recently used salt - any more than half an ounce per gallon may affect the microbes. You should also be aware that Viresco Aqua works more slowly in high pH water, and that both tap and rain water can contain high nitrate levels. If you top up in dry weather, or experience heavy rainfall, you should add more Viresco Aqua. Viresco Aqua can be overdosed with no problem. It is organic not a chemical. We have one customer who each year uses 6 times our recommended dose all at once and for three years has not seen any blanketweed. The only qualification is that enough oxygen should be present. What differences do fish stocking and overfeeding make? The more fish you have, and the bigger the fish, the more waste (ammonia) they produce. Ammonia eventually converts to nitrate which feeds algae. Year on year, fish can increase appreciably in weight. Also, where overfeeding occurs or when very high protein foods are used, more ammonia is produced. More ammonia means more nitrite and therefore nitrate, which is food for the algae. If you think you are overstocked, or overfeeding, double the recommended dosage. Viresco Aqua has an unlimited shelf life as long as it is kept dry. We recommend that you seal the pack and keep somewhere dry and cool such as a drawer in a shed or garage. Viresco Aqua was initially formulated for use on commercial fish farms to improve the growth and health of fish and reduce the disease potential. There are two separate groups of microorganisms in Viresco Aqua. One group is designed to effect rapid water clarification. This is done by efficient microbial reduction of the soluble nutrient level in the water. Blanketweed and algal blooms are rapidly suppressed as they no longer have a food supply. The other part of the formulation digests away waste and dead organic matter on the walls and bottoms of ponds. The amount of Viresco Aqua required for ponds is about 10g per 6,000 gallons (27,000 litres) of water. To calculate the volume of water in your pond multiply the length in feet by the width by the average depth then multiply by 6.23. This will give volume in gallons. If your pond is round or oval, just "square it off" and use the approximate measurements. 1 gram of Aqua will treat 600 gallons, so divide your pack into the required number of portions. You do not need to be exact; just separate the powder on a sheet of paper with a knife. Viresco Aqua powder should be added to between half a bucket and a bucketful of pond water and dissolved. Once the powder is in solution, it should be aerated by whisking, stirring with a stick or using an air stone. Leave for a few hours inside a garage or house away from direct light. Pour the solution into the pond at points all around. Reseal any remaining product and store in a dry, cool place. The microbes in the powder have many years shelf life if kept dry. Viresco Aqua is harmless to fish and plants and it can be over-dosed. However, It is important to have enough oxygen in the water when Viresco Aqua is used as it contains aerobic microorganisms. Pumps, oxygenating plants, waterfalls and fountains are all good oxygenators. If it is used in a pond without sufficient oxygen, its effectiveness is reduced. It could also deprive fish of oxygen. If there is any doubt about the oxygen levels, start with a reduced application and watch the fish carefully. Then continue to add the full amount over a few days. If the fish move to the surface, they are not receiving enough oxygen and aeration will be required immediately. Remember, in hot weather, water does not hold as much oxygen as in cold weather. Our recommended rate of use is normally enough to clear blanket weed in one application. However, there are times when further doses of Viresco Aqua may be required. These usually relate to overstocking or overfeeding of fish. 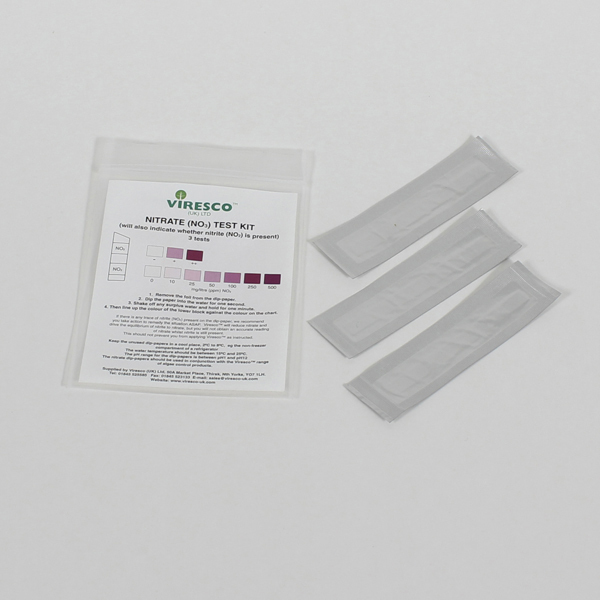 It is recommended that nitrate tests are done when Viresco Aqua is used. Do a test immediately before the Viresco Aqua is applied and repeat weekly. This should show that the nitrate level is dropping and the microbes in the product are working. If little change is seen in the blanketweed within about 3 weeks then a second application of Viresco Aqua is recommended. When the blanketweed has disappeared, it makes sense to add top-up amounts of Viresco Aqua. This could be say one third or one quarter rate every 3 or 4 weeks. VIRESCO AQUA IS NOT A CHEMICAL. IT IS A BIOLOGICAL PRODUCT CONTAINING MICRO-ORGANISMS. VIRESCO AQUA IS HARMLESS TO FISH, PETS, BIRDS, PEOPLE AND PLANTS.